I heard a few adults complaining that HOTEL TRANSLYVANIA (2012) starring Adam Sandler, Kevin James, and Andy Samberg didn't quite hold their attention, making them feel like it was just geared toward their kids. Well hello people! Isn't that exactly who animated features are filmed for... your children? I think the general public is getting a little spoiled, only satisfied if the latest animated feature contains enough 'adult humor' embedded within the dialogue to feed their matures tastes. COLUMBIA PICTURES did a great job of entertaining its target market with HOTEL TRANSLVANIA. Kids will love the diverse group of monsters who've gathered at Count Dracula's 5-stake resort for his daughter Mazis's annual birthday celebration. This year's 118th proves to be special, as a 'human boy' named Johnny stumbles into the resort and begins to fall for the count's teenage daughter. Beyond the obvious popularity of Dracula's many well known guests, young children are exposed to the age old argument of 'sticking to one's kind'. Great openers for conversations with your family, as society's differences are routinely explored. Note: Although the cast is comprised of popular monster figures, they are presented in a friendly and non-menacing manner. Dracula himself is on a replacement diet of 'Near-Blood and Blood-Beaters'. I loved the magical diaper changing and the puddle-sucking sponge. I sure wouldn't mind adding those tricks to my daily routine. Directed by Genndy Tartakovky, this movie is highly recommended for the entire family. 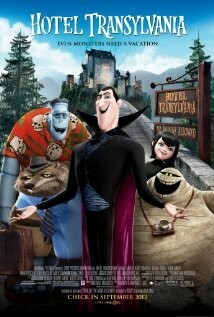 PG, 91 mins, Animation, Comedy, Family, **** 4 stars out of 5.